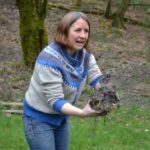 Discover the creative possibilities of making art and craft from and in the natural environment at the Footprint, Windermere. Experiment both indoors and outside with a range of natural materials and processes deepening our connection with nature. Using a bounty of materials such as willow, earth, wool, feathers, ash, clay and stones we will paint, mould, construct, arrange, assemble and weave the materials to create both ephemeral artwork and pieces to take home. Working in the woods we will create site-specific art, extending the artistic process by documenting the work with photographs. During the course, we will look at Land Art and other natural art forms by a variety of artists. Please also be prepared for the weather as the aim is to be outside for the sessions so some sturdy shoes and layers to keep warm, waterproofs or if it is sunny, a hat and suncream may be required! Wear old clothes and prepare to get messy. You may want to bring a camera/phone camera to take images of your work. Please note this course takes place at the Footprint, Windermere. Location can be found here.